Delphi/C++ Builder VCL and FireMonkey (FMX) components library for fast boolean and application logic. 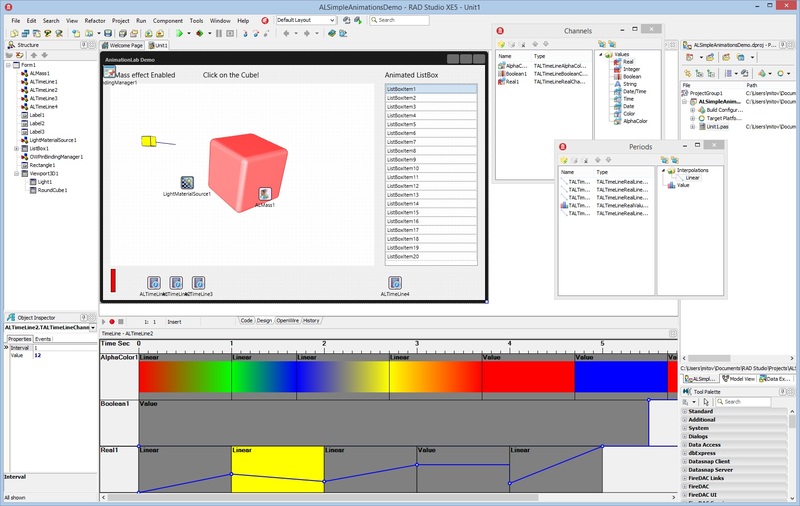 Allows complex timeline based animation of any visual on non visual 2D or 3D component with zero lines of program code. Animate controls, 2D and 3D objects, user interface items, databases, non visual components, forms, and anything else that has properties in seconds! EasyMap VCL (Popularity: ) : EasyMap VCL is a Delphi/C++Builder components set for creating your own GIS-related solutions without MapInfo, MapX, MapObjects, WinGIS etc. VisionLab VCL (Popularity: ) : Delphi/C++ Builder VCL and FireMonkey (FMX) components library for advanced computer vision. PlotLab VCL (Popularity: ) : Delphi/C++ Builder VCL and FireMonkey (FMX) components library for very easy and fast Data Visualization. - Scope Component - a scientific chart component for plotting multi-channel data. VideoLab VCL (Popularity: ) : Delphi/C++ Builder VCL and FireMonkey/FMX components for fast video processing. Allows fast complex video manipulations with zero lines of program code. The library supports many different technologies and allows any mixture of them. IntelligenceLab VCL (Popularity: ) : Delphi/C++ Builder VCL and FireMonkey (FMX) components library for very fast Artificial Intelligence. Some of the components now also include a GP GPU support. InstrumentLab VCL (Popularity: ) : Delphi and C++ Builder VCL and FireMonkey (FMX) GDI+ rendered Visual Instruments. - LED control with On/Off states. - LED control with multiple states. AudioLab VCL (Popularity: ) : Delphi/C++ Builder VCL and FireMonkey (FMX) components library for fast audio processing. Allows audio capture, processing, playback, and broadcastiong with zero lines of program code. SignalLab VCL (Popularity: ) : Delphi/C++ Builder VCL and FireMonkey (FMX) components library for fast Digital Signal Processing (DSP) and data visualization. Video Magic Pro (Popularity: ) : Video Magic Professional is a powerful updated version for Video Magic Standard. Delphi Flash-style Layers panel (Popularity: ) : Delphi Flash-style Layers panel is a Macromedia Flash style Layers menu VCL component for Delphi. Ayra - VCL Report Generator (Popularity: ) : A report designer and generator application written in Delphi, with a WYSIWYG report designer, a VCL component for reports generation, valid for Delphi 5 to 2006, and a little CommandLine application for call. It only run in Windows and spanish. UTF-8 VCL (Popularity: ) : Utf8Vcl allows your Delphi application to become a unicode applications with no changes to your vcl code and third party components. Phoenix Venus VCL (Popularity: ) : Phoenix Venus VCL Components is a suite of UI components designed to both address the short-comings of some standard Delphi controls, and to avoid the clutter created in the development environment by the standard controls. Supports Windows Vista Aero. VCL TestTool Glue (Popularity: ) : A framework for doing test runs and evaluating results with the OpenOffice.org VCL TestTool Application.